Oh Noooooo! Not the Scotch! There supposedly is a Single Malt Scotch shortage in the world. Based on this premise, prices of Scotch have skyrocketed in the past few months – pushing even middling product to over $60/bottle. As a guy who, once or twice a month likes to sit down with a tumbler of the fair Malted – this has become depressing as my supply dwindles. This is sort of like the artificial oil crisis of a decade ago, which pushed gasoline prices over $4.00 a gallon despite there being no shortage. New manufacturers are coming online almost daily. Just in my home state, Virginia, there are several Scotch producers, as well as Bourbon, Rye, and a killer Vodka which is way better than Grey Goose. Japanese Scotch has finally caught up, and excelled as the best Single Malt in the world, with Yamazaki winning the award, Grabbed a bottle months ago, before the price shot up 400%. Not the best from Yamazaki (which costs an astounding $4000 a bottle), but one of the best financially approachable Single Malts at around $60 a bottle. So there isn’t really any shortage, much less one which should affect the prices of the 10-15 year old Single Malts. The only result of this I can see, is a booming business for local distilleries, who are hand crafting some excellent product. I think the big Single Malt producers are about to kill their market. “The current global demand for Scotch is putting pressure on stocks of mature whisky,” says Charles MacLean, one of the world’s foremost Scotch experts and author of theWhiskypedia: A Compendium of Scotch Whisky. 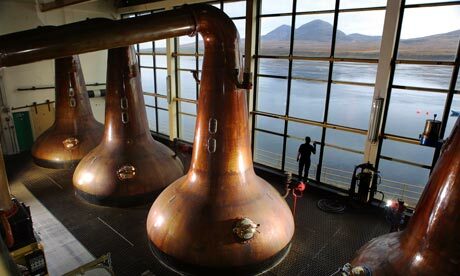 Currently, there are 20 million casks in Scotland aging and that number will surely go up, since there are also many new distilleries opening. “The last ten years has seen an unprecedented number of new distilleries,” says MacLean. And these aren’t all small boutique facilities. The Macallan is working on a new £100 million distillery that is supposed to open next spring and The Glenlivet announced several years ago a £10 expansion, which is set to expand its capacity by 75 percent. That’s not to mention all the Scotch-like whiskies being made around the world, fromJapan and India to even here in America.